Well, the sunshine was nice while it lasted. But now we’re returning to a period of mostly cloudy weather for the next several days, and we probably won’t see much sustained sunshine until Sunday or so. After today we’ll also see a warming trend through Friday before the season’s strongest Arctic front to date roars through the area. Temperatures are starting out in the 40s for most of the region, and due to thickening clouds they’re unlikely to rise much past the mid-50s. However, winds will be fairly light, from the east, so overall today should be a fairly mild winter day. Lows tonight will only drop a few degrees from daytime highs as a warmer, moister southerly flow begins later today. We’ll see continued mostly gray conditions for the second half of the work week, as well as rising temperatures and rain chances. Highs will transition from the 60s on Wednesday into the 70s on Thursday and Friday. Lows probably won’t fall much below 60, if at all, due to the persistent cloud deck. Rising moisture levels will mean the return of on-again, off-again light to moderate rain chances. While we can’t rule out a few thunderstorms, generally we expect moderate accumulations through Friday, with only a few tenths of an inch of rain for most. Hello, cold front. Rain chances will increase late Friday night, and Saturday before noon, as an Arctic front pushes through Houston and moves off the coast. 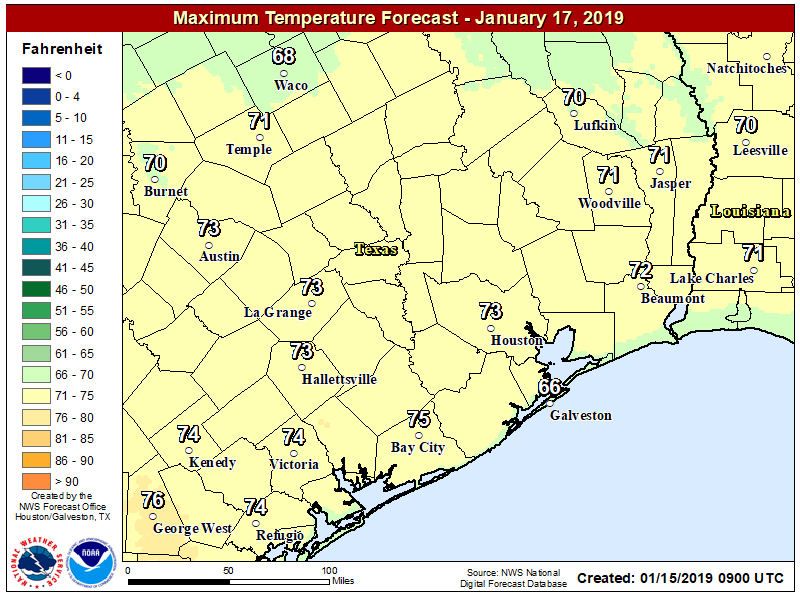 Timing remains somewhat uncertain, but as a best guess it appears as though the front will move through central Houston around mid-morning, and off the coast before noon. Temperatures will fall from around 60 degrees in the morning, into the low 50s during the afternoon, and winds will blow out of the north-northwest at up to 20mph or greater. This will be a cold, blustery day. Lows Sunday morning will probably vary from mid-20s for well inland areas in Montgomery County to near 40 degrees right at the coast. Exact temperatures will be difficult to determine for another few days, but for certain it will be cold and windy, as gusty conditions continue throughout Sunday morning and probably into the early afternoon hours. 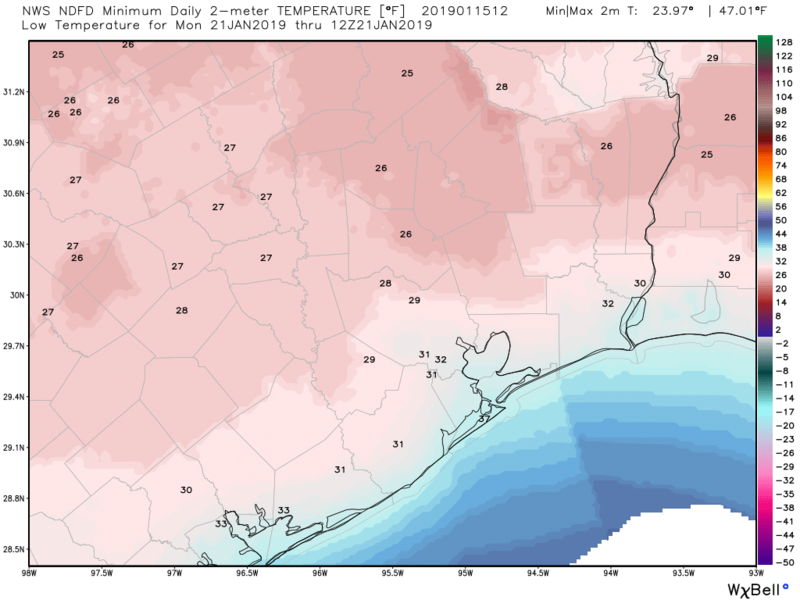 If you’re running the Houston Marathon, expect wind chill temperatures down around 20 degrees, and possibly even colder than that. Highs Sunday are unlikely to rise much above 40 degrees for most of Houston even with sunny skies. Another freeze for much of the region, away from the coast, seems likely for Sunday night. Expect a warming trend through Tuesday before another front, with a decent splash of rain, keeps most of next week chilly. Temperatures should be warm enough to prevent any mischievous wintry mix. lol. I hear you. Lung burn is my biggest problem running in cold weather. I think I’m breathing in through nose and out through mouth and I cover my face but it still starts burning my throat and esophagus. Sweaty cold feet too. Good luck Sunday and hopefully it won’t be too bad with the wind. Extra glad I’m only doing the half this year. I mean, I much prefer it colder than warm, but this is colder than I’d like. Oh man, Sunday’s marathon is going to be interesting. Do we have to worry about pipes on Sunday? I do not think so. If anything, Monday morning should be colder. Even then, pipes do not appear to be a concern at this time. Bring your pipes inside. Wrap your plants and pets. Or something like that. As a half-marathon runner, I’ll take cold and blustery over warm and humid ANY DAY. Thanks for the update! Happiness to see this only refers to the clouds. I feared another eclipse which sends my dear Fulgencio into untold worries and he does not always believe my tellings the sun will come back! I hope all enjoy the cold and have no problems! It’s been a while since we’ve had an arctic front so I’m pretty excited about this one! I always find it fascinating how quickly the mercury can drop with these types of fronts, where it might be 70 in Houston but 45 in Huntsville. I’m just ready for more than three days without rain. We haven’t been able to do anything in our yard for what seems to be months. Never thought I’d wish for a drought. Looking forward to hot chocolate & Netflix this wknd. 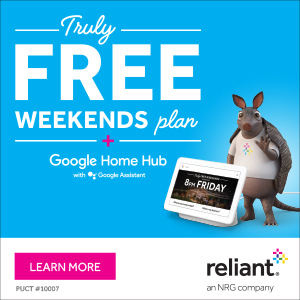 Eric, is Reliant the 2019 sponsor as well? Will the sky at least be clear on Sunday night to bundle up and see the lunar eclipse? Running 26.2 on Sunday. The cold air doesn’t scare me, but that wind may be brutal. Even with proper gear, cold wind is hard to manage on a long run. Good luck everyone! Wind trends are improving, a little.